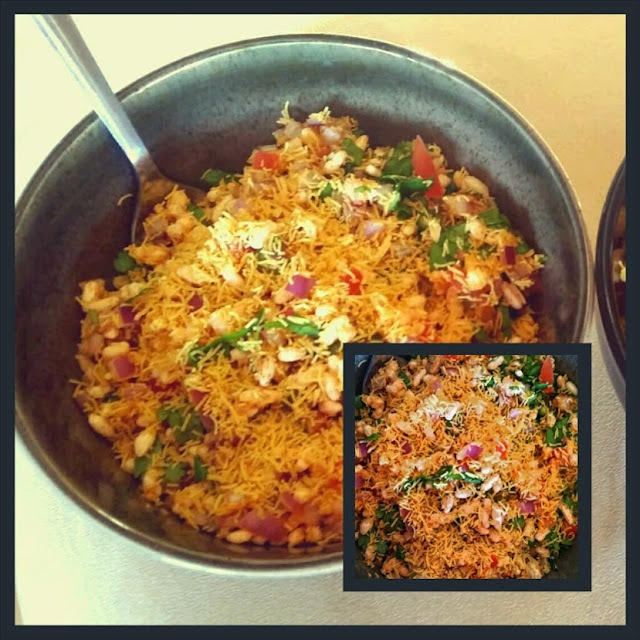 What do you do if you have some leftover kurmura and sev but no chutneys to make bhel? Well, I make sukha bhel of course. A very quick and easy yet filling snack which takes you back to the streets of Bombay with the first bite! There are many variations to this, you can feel free to add anything to this sukha bhel to make it more tasty and healthy. In a dry pan, roast the kurmura for few minutes till they turn crisp. Keep them aside to cool. In a mixing bowl, add the chopped vegetables, green chillies, all the dry masalas, kurmura, lemon juice, chana dal and cilantro. Mix well. Before serving sprinkle sev on top. Enjoy your sukha bhel anytime of the day!